Torquay United centre-back Aaron Downes says the team's defence must return to their previous good form. Having kept eight clean sheets in their first 11 games, including a run of five games without letting in a goal, the Gulls have conceded 16 in their last six matches in all competitions. "We are creating a lot of opportunities," Downes told BBC Sport. "If we can get back to being solid at the back and limiting chances and goals then we're going to win games." 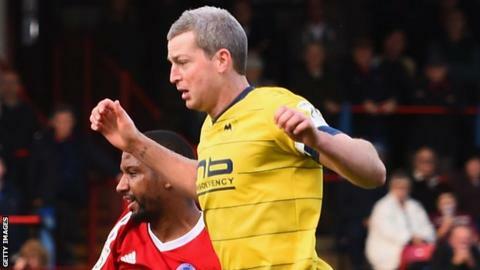 Torquay go into Saturday's Conference clash at Kidderminster having lost five of their last six games after a run of six wins in a row. "But we've still got that belief that we're a good side and a good bunch of lads and a good team and we're more than capable of beating anyone on our day. "Where we've come unstuck, which is a bit frustrating and no disrespect to anyone, is against the lesser teams, the lower teams in them league. "But we can use that as a positive because going into November we've got seven games and all seven teams are in the top 10. "That can only be good for us really as we can take points off teams around us and only look up."